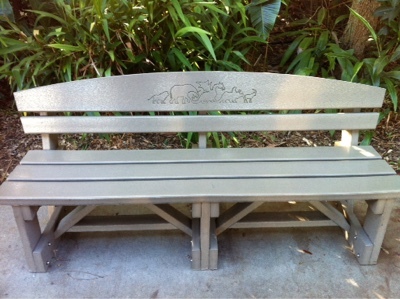 Orlando Visitor: Logo on Disney Bench Research, Led me to World of Avatar! Logo on Disney Bench Research, Led me to World of Avatar! I couldnt help noticing at Disney's Animal Kingdom bus stop that the benches had pictures of animals and wondered why there was a dragon in the center. After doing some research I found out that there were plans in the past for another land being built at Animal Kingdom to be called 'Beastly Kingdom' which would have had mythical creatures and dragons as part of the story. Since then plans have changed and now the exciting new 'Pandora-The World of Avatar' has been constructed. The magic is set to begin on May 27th 2017. Labels: Pandora-The World of Avatar. Disney's Animal Kingdom. Walt Disney World. Disney Bench.